the fundamentals of Judaism in fresh,new ways. TEMPLE ISRAEL a place where COMMUNITY happens! 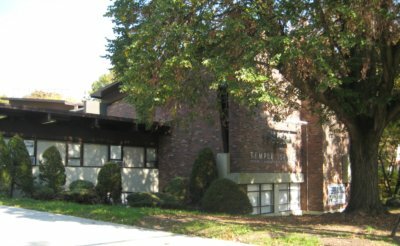 Temple Israel welcomes families and individuals of all lifestyles and life choices as well as those with special needs. Join us and find out how good it feels to be part of an inclusive Jewish tradition. Temple Israel..the community that welcomes the stranger and lets no one stand alone. 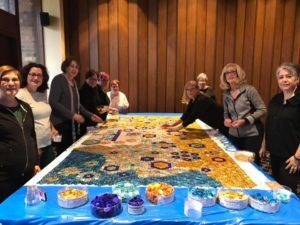 The largest Chocolate Gelt Mosaic was constructed at Temple Israel. IT WAS AMAZING! Sisterhood has done it again. The ladies got together to create the largest and most delicious mosaic made with chocolate gelt. Thanks to the generosity of Dr.Ron Avis Foundation, a number of young families can join our great community at a reduced rate and enjoy many free activities & tuition free Hebrew School. Sun April 14 at 11am SCHOOL MODEL SEDER, Parents are welcome ! Kabbalat Shabbat, Family Shabbat , I-Shabbat, No Shush Shabbat & Torah Study. Find your perfect Shabbat! All Shabbat Services are opened to the Community.”Click here for schedule. CELEBRATE PASSOVER! Catch up on the latest news and happenings. Read the APRIL E-Shalom Bulletin..
Kabbalat Shabbat Services every 2nd, 3rd and 4th Friday at 8pm followed by Oneg. Torah Study every Saturday at 10am followed by Shabbat Service at 11am. TEMPLE ISRAEL, A PLACE WHERE COMMUNITY HAPPENS! Reaching out to Our Community Temple Israel is actively involved with coordinating the efforts of the congregation’s activities, fulfilling the mitzvah of tikkun olam, repairing the world. We have formed strong alliances with various organizations to help achieve our goals. We are the proud originators of the Staten Island Community Days. Check out “Our Affiliates” page under Community..
We LOVE families at TEMPLE ISRAEL. Thanks to the generosity of the Dr. Ronald Avis Foundation for Temple Israel, young families (up to 10) will become members of our congregation at a greatly reduced rate and enjoy a a year of fun programming for BOTH parents and children at no additional cost.. In addition, there is tuition FREE Youth Religous & Hebrew School for all of our members. Your family is always welcome to come and join our family and be a part of our great community. Join us for our fun family oriented events.